In questo articolo vi proponiamo un approccio basato sulla comparazione dei report di Gartner dell’ultimo triennio per analizzare l’evoluzione del posizionamento dei Vendor di soluzioni Enterprise Network Firewalls e Unified Threat Management (UTM) nel quadrante magico (QM) di Garner. Lo scopo è quello di fornire una rapida panoramica di come, secondo Gartner, i Vendor si sono posizionati e di quale sia il loro l’attuale Trend senza fermarsi alla sola analisi dell’ultimo report annuale. Sebbene Gartner divida in due report distinti i prodotti classificati Enterprise Network Firewalls da quelli classificati come Unified Threat Management (UTM) in questo articolo oltre ad analizzare i dati degli ultimi tre i report per ciascuna classificazione proveremo anche da fornire un’analisi globale per i vendor che sono stati valutati in entrambe le categorie. Gartner è una importante azienda nel mondo IT che si occupa di Analisi e ricerche di mercato/prodotto e advisoring e il cui obiettivo è quello di supportare le decisioni strategiche con consulenze e report che hanno lo scopo di fornire un punto di vista “super partes” sullo stato generale di un mercato, di una azienda o dei suoi prodotti. Uno dei report prodotti da Gartner più famosi è il quadrante magico (QM) che è di semplice comprensione perché permette rapidamente di avere una panoramica, secondo Gartner, sul posizionamento che hanno gli attori del mercato. L’analisi del QM va però sempre approfondita con la lettura del documento a cui è affiancato in cui viene motivato in dettaglio le ragioni del posizionamento e che quindi vanno poi contestualizzate negli specifici scenari in cui si sta eseguendo la valutazione perché alcune motivazioni potrebbero essere poco influenti per le scelte necessarie. L’elenco dei Magic Quadrant è disponibile al seguente Gartner Magic Quadrant. L’obbiettivo è quello di ottenere una classifica del Vendor di soluzioni EPP ordinata in base al miglior posizionamento nei quadrante Gartner nel triennio e in base al miglior Trend di posizionamento nel corso degli anni. In base alla classifica ottenuta i leader della categoria Enterprise Network Firewalls del triennio 2015-2017 sono Check Point, Palo Alto e Fortinet mentre Cisco mantiene stabilmente una buona posizione e Huawei sta aumentato la sua competitività. Non vi sono invece Vendor che hanno avuto un trend in discesa, inteso come cambio di quadrante rispetto alla posizione ottenuta nel report Gartner del 2017 confrontato col report del 2016. Offerings: Check Point offers a large breadth of security products covering network, mobile and endpoint. It also offers a mobile security solution, which consists of a software container called Capsule (Workspace, Docs and Cloud) for both iOS and Android, Mobile Threat Prevention, and Capsule Connect/VPN. This makes the vendor a shortlist candidate for enterprises looking for an integrated and consolidated approach to their perimeter, endpoint and mobile security based on the maturity on their enterprise security. Product Execution: Check Point offers a large number of firewall models to meet the requirements of all enterprise network types. Enterprise firewalls include the 12000, 13000, 15000, 21000, 23000, 41000 and 61000 series of appliances. In 2016, the vendor extended the integration capabilities for its vSEC virtual appliance line for VMware, Cisco ACI, KVM, Hyper-V, OpenStack, AWS, Google Cloud and Azure to support public cloud and highly virtualized infrastructure. This makes it a strong enterprise firewall vendor capable of meeting different enterprise deployment use cases. Partners: Check Point has built a strong ecosystem of technology partners including software, server, and networking and managed services. Gartner strongly believes that security vendors should be able to identify and build product support and integration capabilities with the right technology providers to enhance their product offerings. Check Point also has a strong and well-established channel globally, through its partner program. Features: Check Point’s enterprise firewalls offer strong web filtering capabilities with a combination of application control, URL filtering and DLP. It offers mature URL filtering capabilities with multiple end-user block and information pages. It allows end users to explain their reason to bypass policy. 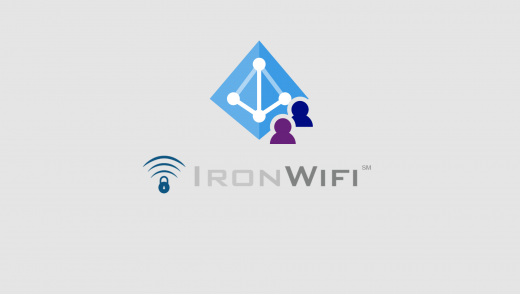 It also offers a user check feature to alert users in real time about their application access limitations, while educating them on internet risk and corporate usage policies. 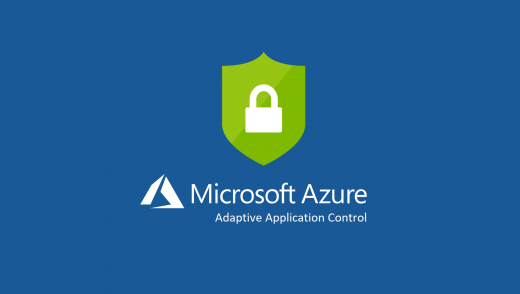 Both application control and URL filtering operations can be performed within the same rule. This makes these firewalls a desirable candidate for enterprises that are considering consolidating their web proxy and require granular web filtering capabilities in their firewall. Clients frequently comment that the Check Point roadmap aligns very well to their enterprise needs of tomorrow, imbuing strong client retention, especially in high-compliance environments. Central Management: Check Point continues to lead the market with its strong, robust centralized management offering, which makes it a desirable vendor for complex firewall policy environments, such as deployments by very large enterprises and organizations that need formal approval workflow, have complex topologies, are subject to compliance that requires reliable reporting or have large operations teams. Even the surveyed VARs and customers have rated this to be the vendor’s strongest feature, and competitors acknowledge Check Point’s leadership in this domain. 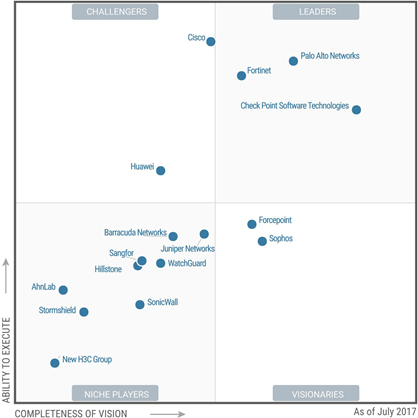 Marketing Execution: Palo Alto Networks is the pure-play security vendor with the highest visibility on enterprise firewall shortlists. The vendor is visible on shortlists across all industries. Presales support is efficient, and the vendor very frequently comes out from shortlists with the highest overall evaluation score. 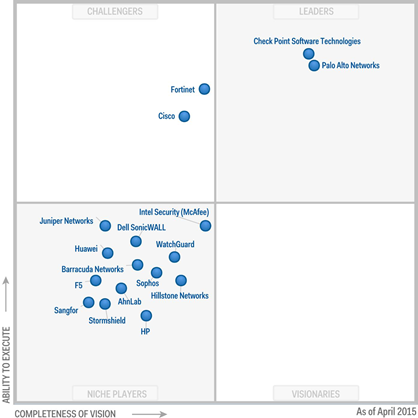 Sales Execution: Palo Alto Networks maintains a very high growth rate. With a list price of $1,000, the new PA-220 allows the vendor to target smaller branches. WildFire, the vendor’s sandboxing option, has the highest attach rate and the largest customer base of all vendors evaluated in this research. Capabilities: The Application Command Center (ACC) includes visibility of sanctioned and unsanctioned SaaS applications. Combined with its automated event aggregation and filtering and drill-down options, it makes it easy to understand application flows and related risks. Customer Experience: Palo Alto Networks has a faithful customer base and scores very highly for overall customer satisfaction. Many clients report that they will renew without performing a competitive assessment and that they recommend the product to their peers. Several clients give good scores to vendor support in North America, and to the vendor’s ability to meet expected performance in production environments. Improvements: The vendor has initiated a refresh of its firewall appliances (PA-800 Series, PA-5200 Series and PA-220), with upgraded performance and a higher number of decrypted concurrent TLS connections. WildFire regional cloud options are available in Europe and Asia. 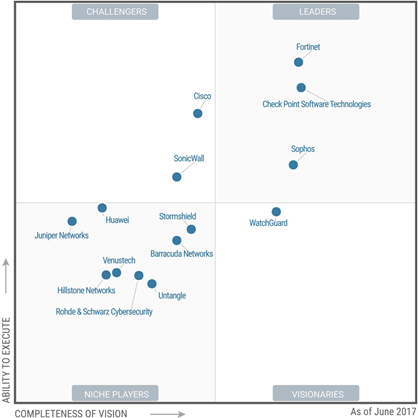 Marketing Execution: Fortinet has improved its visibility in final two vendor shortlists for enterprise firewalls, being frequently the finalist against one of the other two leaders. Surveyed channel partners acclaim Fortinet’s assistance during RFP and implementation. Sales Strategy: Fortinet excels in providing the best price/performance offers, relying on the combined use of an extensive appliance portfolio, good total cost of ownership for bundles and a flexible discount strategy. The vendor grows much faster than the market average. Customer Experience: Fortinet’s clients gives excellent scores to its firewall performance and hardware quality. Capabilities: Customers not using centralized management tools liked the improved visibility they get from the FortiView reports. Fortinet customers also mentioned ease of deployment as a strong point. Market Segmentation: Fortinet’s latest chassis models (7000 Series) reinforce its ability to serve the performance required in large data centers. In base alla classifica ottenuta i leader della categoria Unified Threat Management (UTM) del triennio 2015-2017 sono Check Point, Fortinet e Sophos, mentre Cisco e SonicWall mantengono stabilmente una buona posizione, Juniper Networks ha invece avuto un trend in discesa, inteso come cambio di quadrante rispetto alla posizione ottenuta nel report Gartner del 2017 confrontato col report del 2016. Market understanding: Check Point continues to make investments to address SMB clients and MSSP requirements. Its recently announced Check Point Infinity relies on principles that appeal to smaller organizations with multifunction platforms, a block-first strategy and intuitive management for small teams. Management console: Check Point’s reporting and management console and on-device GUIs are consistently rated very highly by midsize companies that need to handle complexity. R80 introduced integrated application control directly in the access policy. A SaaS discovery report is available. Capabilities: Check Point’s UTM solutions benefit from its enterprise-level security features, such as the Anti-Bot option, threat intelligence feeds and credible intrusion prevention system (IPS), backed up by a robust threat research team. 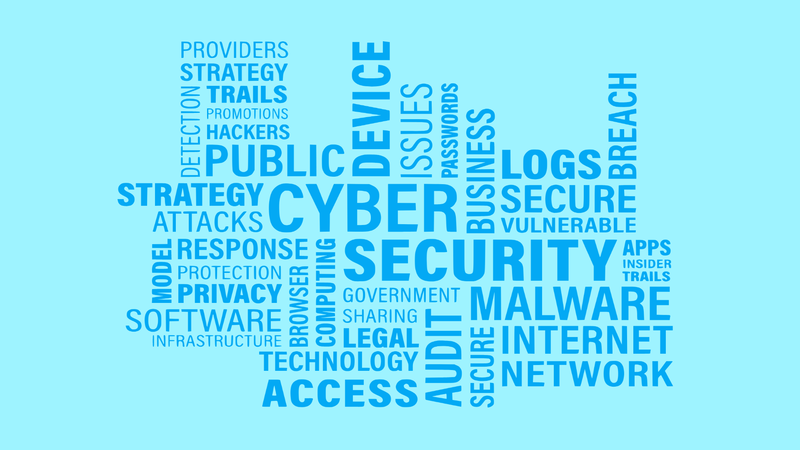 Its solutions consistently get high scores in independent testing for threat detection rate. Check Point’s sandboxing solution is now available for all of its firewall models. Capabilities: Check Point provides a strong set of network options to protect against custom malware with its sandboxing subscription (SandBlast Emulation Service), a variety of threat intelligence feeds (ThreatCloud IntelliStore) and a feature that can automatically remove suspected harmful content from downloaded files (Threat Extraction). Customer experience: Partners and customers note that creating and using objects easily is a particular strength. Some clients report that the compliance blade can facilitate audits of configuration in regulated environments. Client feedback on the new software versions in the R80.x family has been positive. Marketing and sales execution: 2016 saw a clear uptick of SMBs opting for NGTP and NGTX feature bundles, allowing these organizations to utilize advanced security features without the complexity of having to buy and deploy eight to 10 software blades individually. Geographic strategy: Fortinet has the largest channel presence across all regions, and its customer base is vastly distributed. Vendor support centers are available in 10 countries. In 2016, the vendor announced the opening of a European data center, based in Germany, for its FortiCloud and FortiSandbox features. 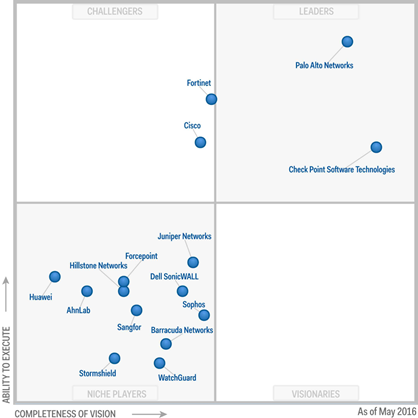 Marketing and sales execution: Fortinet is the clear leader in this market. It is the most visible vendor in SMB multifunction firewall client shortlists observed by Gartner. Fortinet is profitable, and its 2016 revenue grew almost twice as fast than the market average. It is also the vendor most frequently cited as being the strongest competitor in this market by surveyed resellers. Customer experience: Fortinet provides very good performance and pricing to its SMB customers. Results from survey and Gartner client inquiries are consistent in highlighting this. Capabilities: Fortinet’s security services are driven by a large threat research team. 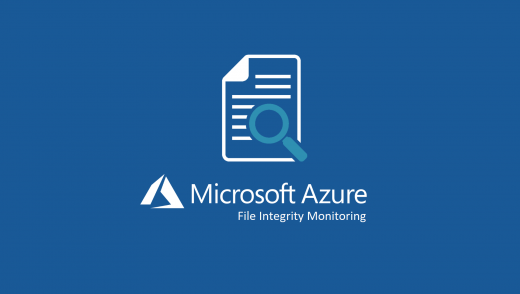 Dedicated application profiles for SaaS visibility and control are also available. Market understanding: Fortinet offers integration between many products in its portfolio, including firewalls, endpoint, wireless access point and switches. The concept, named Fortinet Security Fabric, gives customers willing to invest in multiple Fortinet solutions a unified view of their infrastructure and the ability to manage AP and switches directly from the Fortigate console. It also allows integration with Fortinet’s endpoint solution (FortiClient) to perform a health check before authorizing a connection to the network. Capabilities: A majority of surveyed customers and partners mention security feature richness and breadth as a reason for the selection of Sophos. Continued execution on an aggressive roadmap has strengthened prospective buyers’ view of Sophos UTM as a security leader. 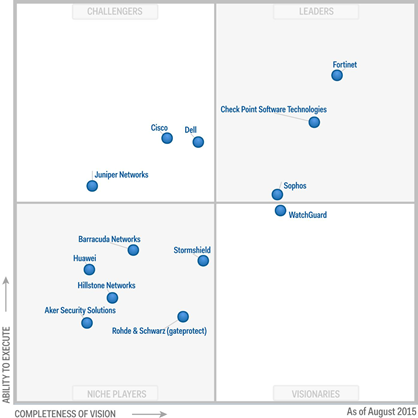 Sales execution: Sophos has a significant IaaS presence relative to most UTM competitors. The SG line has an integrated Web Application Firewall feature, which is useful in making Sophos UTM increasingly relevant to public cloud deployments. Capabilities: Sophos customers and partners cite on-box UI quality and the ease with which they can interact with it as strong positives. Technical architecture: With Security Heartbeat, the recently added capability to isolate endpoints missing a heartbeat, Sophos Synchronized Security is maturing and has become a recognized differentiator. The feature is tightly integrated in the management interface and provides a unified dashboard. It is still evolving, but shows increasing promise in enhancing the security posture of midmarket organizations willing to make the effort to integrate firewall and an endpoint. Customer experience: Sophos is the only UTM vendor to offer three months of free support, along with a one-year warranty for customers that want to try Sophos UTM before committing to paying for a support contract. Product strategy: Juniper’s product strategy lacks focus for SMB security use cases. Its product strategy and roadmap are more focused toward enterprises and carrier-class requirements. Capabilities: Juniper SRX still lacks features desired by SMBs, such as strong, mobile VPN clients, enduser quarantine for spam, and endpoint security management. It has just released SSL encapsulation of IPsec traffic for remote hosts as a work-around for its lack of native SSL VPN capabilities. The vendor does not offer cloud-based management of Juniper SRX, which can be an important feature for cloud enthusiast industries, such as retail and education. Sales execution: Juniper is hardly visible in SMB multifunction firewall client shortlists observed by Gartner. The vendor is quickly losing market share. Advanced malware prevention: Juniper’s advanced malware prevention subscription known as Sky ATP is not available on smaller UTM models SRX 110 and SRX 220d 200. Sky ATP can inspect HTTP and HTTPS, but does not support IMAP. The vendor has only released support for SMTP in March 2017. Technical architecture: Juniper lacks an EPP offering. Juniper security information and event management (SIEM) supports many third-party endpoint solutions, but there is not yet any integration between SRX firewalls and third-party endpoint protection platform vendors. 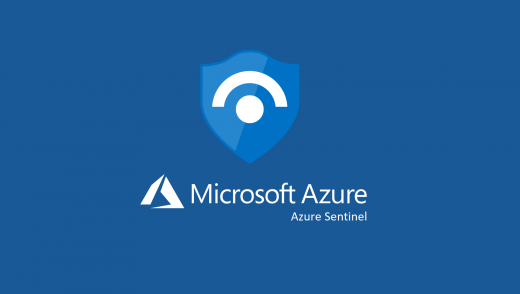 The vendor has recently announced an API and partnerships to integrate with third-party endpoint vendors in the future. Customer experience: Juniper receives below-average scores for ease of initial deployment, stability of its firmware updates and the quality of its app control feature. In base alla classifica ottenuta i leader delle categorie Enterprise Network Firewalls e Unified Threat Management (UTM) del triennio 2015-2017 sono Check Point e Fortinet e Sophos, mentre Cisco mantiene stabilmente una buona posizione e Sophos sta aumentato la sua competitività, Juniper Networks ha invece avuto un trend in discesa, inteso come cambio di quadrante rispetto alla posizione ottenuta nel report Gartner del 2017 confrontato col report del 2016. Since starting Gartner Peer Insights in October of 2015, we have collected more than 75,000 reviews across over 260 markets. In a growing number of markets, we’ve collected enough data to help our clients with a top-level synthesis of which vendor products are the most valued by customers in a given market. We recognize them with a distinction showcasing top vendors in a market. • An average overall rating of 4.2 stars or greater. • In markets where more than seven vendors meet the above criteria, the seven vendors with the highest number of published reviews within the submission period will be selected for the designation. 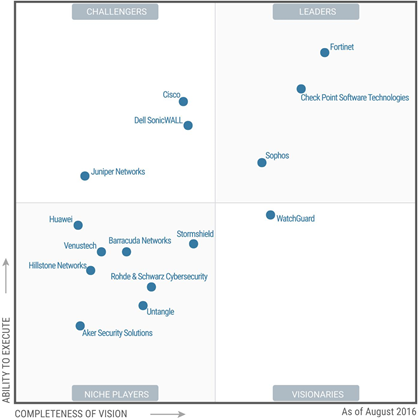 In base alla classifica ottenuta dalle Reviews i leader della categoria Unified Threat Management (UTM) sono Cisco e Fortinet seguiti da SonicWall e Sophos. In base alla classifica ottenuta dalle Reviews il leader della delle categorie Enterprise Network Firewalls e Unified Threat Management (UTM) è Fortinet seguito da Cisco. Ovviamente come già scritto precedente prima di trarre conclusioni è necessaria la lettura del documento a cui è affiancato il QM Gartner, inoltre le considerazioni relative ai vendor ovviamente prendono in esame la situazione che vi era alla data di pubblicazione del report, quindi, ad esempio, nel caso del QM Gartner del 2017 ovviamente alcune affermazioni relative a funzionalità del prodotto o alle scelte tecno – commerciali del Vendor che hanno portato al posizionamento potrebbero non essere corrette se valutate dopo il 24 luglio 2017, per la categoria Enterprise Network Firewalls, o dopo il 20 giugno 2017, per la categoria Unified Threat Management (UTM). L’analisi dell’evoluzione del posizionamento nel quadrante sulla base della formula che abbiamo proposto può ovviamente non essere condivisibile, ma sicuramente la valutazione del Vendor sulla base di più report può aiutare a determinare la scelta di un prodotto della categoria Enterprise Network Firewalls e/o nella categoria Unified Threat Management (UTM) che dovrà essere utilizzato per alcuni anni sebbene debba essere impiegato per gestire una delle problematiche IT più dinamiche come la protezione perimetrale dell’infrastruttura informatica aziendale. In ogni caso la classifica può essere rivista inserendo nel calcolo dello Score dei parametri che vadano a pesare la presenza e l’implementazione di determinate funzionalità indispensabili nell’infrastruttura IT oggetto della valutazione. L’analisi che abbiamo proposto può quindi essere utilizzata come metro di valutazione per la scelta di una soluzione Enterprise Network Firewalls e/o Unified Threat Management (UTM), ma anche come parametro di confronto per valutare una soluzione presentata durante un incontro commerciale o ancora come strumento per giustificare le propria scelta nei confronti della Direzione aziendale.